1. What should be taken into account to calculate the good and the bad of a human in astrology? 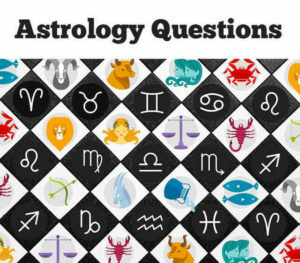 Answer: Horoscope and astrological calculation. 2. What is called for the way of working to know the result which one has to undergo from birth to death as a result of the good or bad he or she had done in the previous birth? 3. What is called for the way of working used to find out and examine the temporary situation of sign, planetary position etc. to know which one of good or bad is doing in this birth and to understand by the help of horoscope that what he is suffering now is the after effect of what all things which he had done in his previous birth? 4. What is situated at the top of the Zodiac? 5. Aries sign appears in which shape? Answer: In the shape of goat. 6. Taurus sign appears in which shape? Answer: In the shape of bull. 7. Which sign is represented by the twins Castor and Pollux? 8. Which sign appears in the shape of crab? 9. Leo sign appears in which shape? Answer: In the shape of lion. 10. Which sign appears in the shape of a woman who travels in a boat, holding fire in one hand and an ear of paddy in the other hand? 11. Which sign appears in the shape of a man who holds balance in one hand and weighs the things? 12. What is the shape of Scorpio sign? Answer: The shape of scorpion. 13. Which sign is seen in the shape of one which holds bow and arrow and having the shape of horse below the waist and the shape of man above the waist? 14. Which sign appears in the shape having face of deer and body of crocodile? 15. Which sign appears in the shape of a man who carries pot on the shoulder? 16. Which sign appears in the shape of two fishes of which heads and tails are joined together? 17. Twelve signs always rotate to which direction? 18. Each sign takes an average of how many minutes to rise? 19. How many times Zodiac rotates while the sun travels through the upper level to east and passes a sign? 20. Moon takes how much time to pass a sign? There are coincidences and many of a questionable state of mind and can become a belief but nothing is Pre-Ordained, !.